The ECROS Technology Prius Mini-Scanner is intended for owners of the Toyota Prius gasoline / electric hybrid car who wish to familiarize themselves with the operation of this remarkable vehicle and learn to drive it as economically as possible. The Mini-Scanner can also be used by researchers to study various aspects of the hybrid powertrain. It can be installed in the car with all cabling concealed behind the dash and can be left connected to the DLC3 at all times. It senses when the car is turned off, powers down automatically and then consumes no current. The operator presses the On/Reset button to turn it on and uses three pushbuttons to select the mode of operation. If the Mini-Scanner is to be operated while the car is driven, a longer cable allows the unit to be placed at a passenger seat. 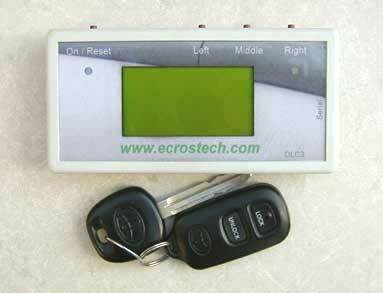 Retrieves and Displays Data on Operation of Hybrid System, Engine, Battery, etc. The Prius Mini-Scanner works only with the second generation Prius, that is model year 2001 to 2003cars, sold in the United States and Europe. It is not intended for the first generation Prius, sold in Japan prior to 2001. It does not work with the third generation Prius, beginning at model year 2004, because the data that the Mini-Scanner retrieves is no longer available over the OBD-II bus. If you are interested in a Mini-Scanner for the third generation Prius, see the Yahoo! discussion group Prius_Miniscanner_MarkIII. More surprisingly, the Prius Mini-Scanner does not work with second generation Prius sold in Japan. This is because the encoding of data on the OBD-II bus differs from the US and European cars. There are Prius Mini-Scanner owners in the US, Canada, England, France, Germany, Holland, Austria and Norway. To get the full benefit of a Prius Mini-Scanner, you need access to a computer with a serial port and a terminal emulator program. Even if you don't use this for logging data, new functionality is from time to time added to the Mini-Scanner firmware and you will need this setup to replace the firmware with an updated version. If you have access to a Windows-based PC, you're very likely all set. PDAs are also reported to work fine. However, if you have a Mac with no serial ports you may not be able to update Mini-Scanner firmware. Please take this into consideration when ordering. To have ECROS Technology update the firmware, you must pay shipping plus a fee of $10.00 to cover labor and return shipping. The fee is waived for the first update only for owners who ordered their Mini-Scanner prior to February 25, 2004, when this problem with Macs came to light. Do you have questions about the Prius Mini-Scanner? Perhaps they are already answered here. If not, please contact ECROS Technology. A driver's center arm rest. Friction brake and engine run indicators. A remote trunk lid release. A cruise control with remote control. A bolt-on receiver hitch and accessories for carrying bikes and cargo. The Prius ViewTech Multi-Media System that uses the built in display screen for backup / night vision cameras, after market navigation systems, DVD players, etc. Material on this page is Copyright © 2004 - 2015 ECROS Technology, all rights reserved.